Does every word in the Bible only have one meaning? This blog post addresses the common, evangelical claim that every word in the Bible only has one meaning. A poem by William Cowper. Questions regarding the validity and foundation of exegetical preaching. Why you should value people more. Thoughts on what to do when fighting sin seems more costly than the sin itself. Are 'affections for Jesus' a good way to be assured of salvation? What a shame that Christians aren't interested in learning foreign languages. How Bang! is a metaphor for the possible relationships man can have with God. 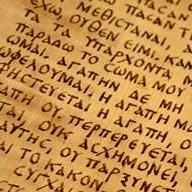 A few thoughts on one of the articles from a prominent statement on Biblical Hermeneutics. Why you MUST pull yourself up by your own bootstraps. When Christians discuss sanctification, we are prone to say things like "Don't pull yourself up by your own bootstraps". I think this is absolutely false and has devastating consequences. This blog post identifies two of the false dichotomies underlying this mistaken understanding of sanctification and demonstrates why they are not Biblical.